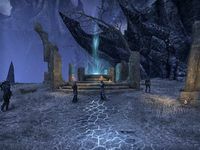 Aba-Darre is an Ayleid well in northwestern Coldharbour, east of Spurned Peak. Initially, this location is inhabited by four Dremora. After they are defeated, more enemies will appear in waves; the last to appear is a powerful daedroth named Sthorha the Crazed.